How Do You Get Millennials Focused on the Issues Facing Americans Today? 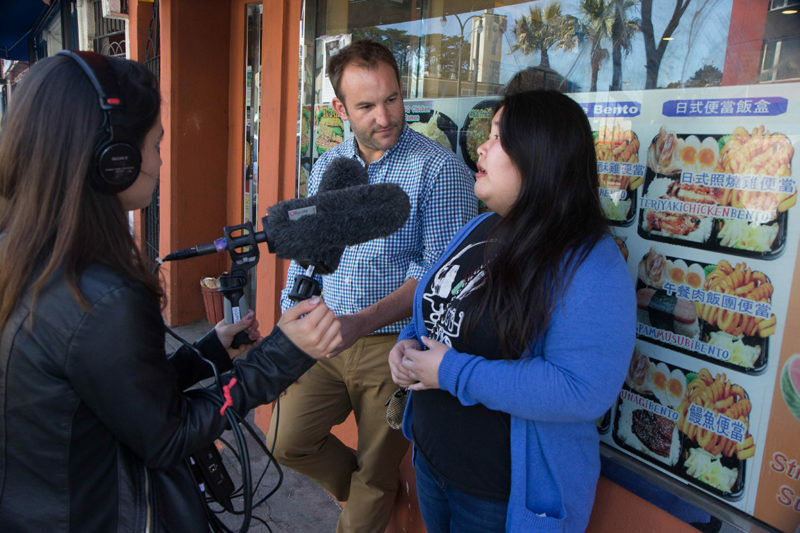 Kasey Saeturn, a 20-year-old journalist, got the idea for her most recent reporting project while attempting to grab take-out in Oakland's Chinatown. That summer afternoon, she and other reporters left the Youth Radio headquarters to find cheap eats. Most returned empty-handed, unable to find anything affordable in the gentrified neighborhood. The situation prompted Saeturn, a first-generation Mien-American whose family came from Laos, to think about urban renewal, wondering: Was a lack of affordable cuisine unique to the Easy Bay or did kids across the country choose between an empty stomach and an empty wallet? To answer her question, Saeturn built a map and used Facebook and Twitter to collect responses from across the country to fill it. Last month, her story (which was produced by Youth Radio) appeared before a national audience on NPR's website. "I wouldn't have even found out if I liked [storytelling] if I didn't join Youth Radio. I never saw myself as a journalist," Saeturn, a college student with a second job at a ramen shop, says. With kids manning the mics, Youth Radio, a public radio station, launched from Berkeley, Calif., in the 1990s. As shootings ravaged low-income neighborhoods, its founder, Ellin O'Leary, hoped to end the prevailing news narrative that all teens were violent gangbangers or victims by giving minority, low-income youths the opportunity to explain their lives for themselves. That mission continues today at bureaus in L.A., Atlanta and Washington, D.C., as Millennials -- burdened with college debt and unemployment -- create stories about living in a hashtag-centric world. Keeping up with the times, Youth Radio now also streams its content online and in 2009, started its Innovation Lab, a digital storytelling platform, where young people design interactive mobile apps that give a fresh take on the news in a format that's relevant to their peers. "There's multiple ways to tell a story," says Asha Richardson, a Youth Radio alum who now manages the Innovation Lab. Richardson, the station's former tech journalist, wanted her reporting to go beyond the reels and was intrigued how technology -- video, music, graphic design, coding -- and new platforms that appealed to her peers enhanced reach and storytelling impact. Students in the program (80 percent come from low-income homes) receive real-world tech skills, learning not only how to use a recording device, set levels and mix their audio, but also how to design and code, says Lissa Soep, a senior producer who cooked up the Innovation Lab with Richardson. APPLY: Youth Radio is an NBCUniversal 21st Century Solutions grant winner. Apply to the 2016 program here. Youth Radio's apps transform the century-old two-minute radio story and make it better by allowing a reader to spend as much time with a story as she desires (the same way a listener could binge on Serial). A series of interviews about gentrification in five Oakland neighborhoods, for example, allows a visitor to turn about the city through an online map, visiting schools and playgrounds, a Disneyesque theme park, grand old hotels and new high-rise condos. Richardson's Bucket Hustle app combines trivia questions about California's drought with an arcade-style game of collecting falling water drops in a bucket. And another online interactive, Double Charged, lets a viewer follow three people through the juvenile justice system and watch as thousands of dollars in fees pile up throughout the process. Youth Radio's multi-platform approach extends young people's voices far beyond their Twitter feeds and Tumblr accounts. So far, its stories have reached more than 28 million users and the digital tools created in its Innovation Lab have an active user base of more than 3 million people worldwide. That ability to reach a diverse audience changed the way Saeturn thinks about her own life and how much she's willing to share on the radio. When she sits down to brainstorm, she asks herself, "What's going on in my life that other people can relate to?" Knowing her words will be shared justifies "putting all the thought and feeling and heart" into each story, hoping her experience helps another young person listening on the web. More than any hackathon or a media studies class, Youth Radio allows young people to express themselves and connect with listeners. By telling stories, Saeturn feels like she's finally found her voice. Not in the sense that it gave her thoughts and opinions she didn't hold before, but that it gives her a platform to stand on. "A lot of adults, they don't really care for what children have to say. To them, it's whatever we say goes. They forget that the youth is our next generation. They forget that we have the same thoughts and opinions as you do. We have worries as well," Saeturn says. "That's the biggest thing: we've been silent for so long, forced to believe that nobody cares." With Youth Radio as their outlet, they're finding people that are willing to listen. Online, they're able to reach more of them than ever before. Youth Radio is a recipient of last year's 21st Century Solutions grant powered by the NBCUniversal Foundation, in partnership with the NBCUniversal Owned Television Stations. The grant celebrates nonprofits that are embracing innovative solutions to advance community-based programs in the areas of civic engagement, education, environment, jobs and economic empowerment, media, and technology for good. Apply here for a chance to be one of the 2016 winners!